Two Senators reached across party lines and today introduced a climate bill that would limit carbon trading, return 75% of permit revenues to households, and close the giant “offsets” loophole in both the Waxman-Markey bill passed by the House in June and the Kerry-Boxer bill now stalled in the Senate. With its fresh, “cap-and-dividend” architecture, the bill might stimulate Congress to consider alternatives to the embattled cap-and-trade approach. 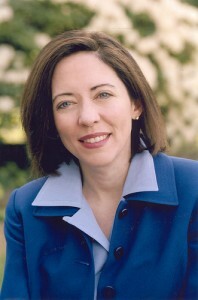 While the Carbon Limits and Energy for America’s Renewal (CLEAR) Act was largely written in recent months by Sen. Maria Cantwell (D-Wash.), its co-sponsorship by Sen. Susan Collins (R-Maine) is noteworthy because bipartisan support will almost certainly be needed to win the 60 votes required for passage. prevent “Wall Street traders or speculators” from “manipulat[ing] prices or supply for consumers” by limiting participation in the permit market to the few thousand upstream entities with a compliance obligation — fossil fuel producers and importers. No offsets, vs. offset allowances of up to a third of current U.S. emissions in K-B/W-M.
Guaranteed return of 75% of permit revenues to households, vs. a lesser and “squishier” percentage return in K-B/W-M.
An attempt to tighten limits on permit trading. More ambitious reduction targets than in Waxman-Markey. Still to be determined, however is how the limits on permit trading will interact with large energy users’ interest in hedging against the inevitable seasonal and cyclical price swings. Also of concern is the low “price collar” in the bill: a range of $7 to $21 per ton of CO2 in the initial year, 2012, rising each year at approximately 6% above inflation. CTC’s Carbon Tax Impact Model (download spreadsheet via this link) suggests that the economic incentives from this price trajectory will only lead to a 7.5% drop in U.S. CO2 emissions from 2005 levels in 2020. (And 2020 emissions would actually be 1.5% greater than the likely depressed 2009 figure). Reportedly, Cantwell’s staff believe that the clean-energy investment provisions in the bill will make up the to for the 20% goal, suggesting that they view the permit mechanism more as a funding source than an inducement to cut carbon directly. Nevertheless, the Cantwell-Collins CLEAR Act is a milestone: the first bipartisan legislation that seeks to guarantee return of most revenues to American families and to limit speculative permit trading. It demonstrates that cap-and-trade is not the only mechanism for putting a price on carbon emissions. Perhaps it will open the door to serious consideration of the “gold standard” of carbon pricing: a revenue-neutral carbon tax. Photo: Flickr / Casino Connection International. The “environmental certainty” of the cap is not of paramount importance if the cap does not reasonably assure avoidance of catastrophic climate change (which it doesn’t). Considering the propensity of allowances to be lower — not higher — than expected under cap-and-trade, the price floor would be more likely to influence emission levels than the price ceiling. The ceiling would probably be based on a willingness-to-pay criterion, which would be an equally good criterion for determining the floor. Based on historical experience (with SO2, RGGI, EU-ETS), greater emission reductions would likely be achieved by negotiating a higher floor in exchange for a lower ceiling, to the point where the floor is equal to the ceiling. With a price floor equal to the ceiling, the cap becomes irrelevant. (The cap is largely irrelevant to environmental goals, anyway, since it is not based on climate stabilization requirements.) Furthermore, trading, banking, offsets, and economy-wide linkage, which all operate to minimize allowances prices, would no longer be needed because prices would be fixed. Elimination of those elements would greatly simplify the regulatory system. Thus, environmental effectiveness would be improved while also simplifying the regulatory system. We applaud CLEAR’s proposal to “recycle” 3/4 of revenue to households instead of giving away allowances to everyone with a lobbyist as cap-and-trade proposals would. But CLEAR hasn’t overcome other cap-and-trade flaws. While its price collar would limit volatility, the bill abjures a clear, briskly-rising price signal, instead purporting to achieve 2/3 of emissions reductions from projects funded by 1/4 of its revenue (the other 3/4 would be recycled to households as “dividends”). In that sense, CLEAR looks more like a subsidy bill than a carbon pricing system. See CTC’s analysis under Bills. Picking up on James Handley’s comment regarding subsidies – the issue of what to do with revenue from a carbon fee or tax has been raised on many occasions on this website. I think I even saw CTC staffers advocating for a small fraction of the revenue being spent on something other than a rebate to citizens (I cannot remember the details – maybe it was support to government entities that would incur increased energy costs under a carbon fee). Directing all carbon revenue to individuals would avoid endless debate over how to fund everyone’s pet projects. Nevertheless, I think a few uses of the fee (other than a rebate to individuals) have some merit. Below, is what I think is a semi-comprehensive list of proposed uses of carbon fees. I hope it will lead to useful discussion. 1. Industry Transition Subsidy – Congressman Larson’s bill (H.R. 1337) allocates one-twelfth of carbon tax revenue to an industry transition fund in the first year. The fund gradually declines to zero in ten years. The fund would assist industries that are especially hard-hit by the carbon fee. I suspect something like this will be a political necessity and may be justified by considerations of fairness. 2. Border Tax Adjustments – H.R. 1337 includes a border tax on imported energy-intensive goods coming from countries that do not have carbon taxes. It also includes a credit to exported energy-intensive goods headed for countries lacking carbon taxes. If expenditures on credits is greater than income from import fees, the carbon fee seems the logical place to get the revenue needed to make up the difference. 3. Research and Development – Senator Cantwell’s bill allocates a major portion of carbon fee revenue to R&D aimed at greenhouse gas (GHG) mitigation technologies. Having spent a fair amount of my career in energy R&D, I strongly oppose spending carbon fee revenue on R&D. I know my view is heresy, but the technical community has done a masterful job of deceiving the public on the value of government-sponsored R&D. Governments will go on funding R&D regardless of the existence of a carbon fee; there is no need to divert carbon fee revenue to R&D. 4. International Climate Change Obligations – The United Nations Framework Convention on Climate Change clearly states that developing countries are to undertake emission mitigation measures and that developed countries are to contribute money to those ventures. Nothing the U.S. does in regard to cutting greenhouse gas emissions will make much difference in mitigating climate change if developing countries do not join the effort. An international carbon fund that collects revenue based on quantity of emissions and distributes revenue to nations according to their populations for climate change mitigation and adaptation would be a logical extension of the U.S. carbon fee system. The U.S. would be a net payer in such a system. Carbon fees would be the logical place to get revenue to pay the U.S. share of such an international fund. 5. Energy Cost Assistance to Governmental Entities – While we may hope that increased energy costs will induce governmental entities to cut energy consumption enough to keep overall energy costs from rising, I think we have to acknowledge that energy costs will probably rise. State and local entities cannot run deficits the way the U.S. government can; and increasing taxes or cutting services can be difficult. Some of the carbon fee revenue should be allocated to state and local government assistance. The assistance should be de-linked from actual energy use to maintain the incentive for government entities to implement conservation measures. 6. Subsidies to Renewable Energy – Carbon fee revenue should not be used to pick winners among the various competing methods of generating low-carbon electricity or producing low-carbon liquid fuels. Current subsidy programs are being carried to absurd degrees. For example, the average government subsidy for photovoltaics in the U.S. is $3 per Watt (the full cost is close to $8/Watt), which is enough to fully pay for the installation of an equivalent amount of wind generating capacity. A small subsidy program to support a few demonstrations may be okay; but we need some reasonable limits. The February, 2008, issue of Harpers Magazine has in interesting article on economic bubbles. It argues that the RE Bubble of the first type (i.e., real estate) is likely to be replaced by an RE Bubble of the second type (renewable energy). A carbon fee is intended to generate useful price signals within the economy by charging for pollution. Heavy subsidies distort price signals and, in extreme cases, generate economic bubbles. 7. Subsidies to Other (non-RE) Greenhouse Gas Mitigation Measures – If carbon fee revenue is going to subsidize any domestic program in a big way, energy conservation programs would be the thing to subsidize. If we are going to give carbon fee rebates (or dividends) to individuals, we should at least be able to make sure that they have weather-stripping, fluorescent lights, and programmable thermostats in their homes and that they have been educated about energy costs and opportunities for conservation. However, this is my pet program and I would willingly give it up if doing so would induce others to give up their pet ideas for allocating carbon fee revenues. 8. Support for Medical Costs, Debt Reduction, and Other Non-GHG Governmental Programs – These things are not related to the climate change issue and should be dealt with separately from a carbon fee. They detract from the simplicity and directness of a carbon fee system. It may be justifiable to tack fees onto certain fuels and fuel-burning systems to raise revenue to cover the Department of Defense’s costs of defending petroleum supplies and supply routes and to cover the costs of treating asthma and other diseases caused and aggravated by non-GHG air pollution. However, those matters are distinct from climate change and should be addressed separately. To summarize, carbon fee revenue could legitimately be used to support Item 1 (temporary transition subsidy to industry), Item 2 (border tax adjustments), Item 4 (international climate change mitigation and adaptation), Item 5 (state and local government energy assistance), and maybe Item 7 (conservation subsidies). The major use of fee revenue should, of course, be a rebate or dividend to individuals. I would be interested in how others think on this issue.